The following table represents our standard listing of MLC’s produced from our ultra-stable EIA Class I COG dielectric. In addition to the below listed standard case sizes, WCI is ideally situated to custom fabricate alternative size, thickness and/or voltage ratings per individual requirements. Should you not find what you are looking for please call the factory. Produced according to meticulously defined standards, all parts are then conditioned at elevated temperature and voltage. 100% of all lots are screened for conformance to stated performance criteria. All units are tested to MIL-PRF-49467 however customer required screening can also be accommodated. Our high reliability line of COG capacitors are very well suited to applications requiring extremely stable electrical properties given time, temperature and voltage. Common applications include aerospace, defense, pulse energy detonation and higher end consumer needs requiring a greater degree of safety/reliability not usually found in “cots” parts. Dimensions are ±5% length and width or .015;, whichever is greater. Note: These are standard sizes. We can manufacture any size required. Please consult factory for special builds. 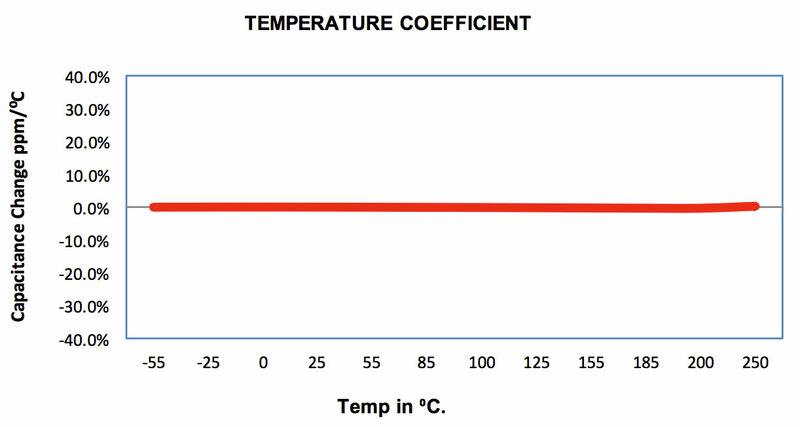 Operation Temperature Range: -55°C to 125°C. Dissipation Factor: 0.1% max at 25°C. Insulation Resistance: at 25°C > 100GΩ or 1000MΩμF or whichever is less. at 125°C > 10GΩ or 100MΩμF or whichever is less. Dielectric withstanding Voltage: 250% for parts ≤250V. Aging Rate: 0% per decade. Testing Parameters: 1kHz, 1.0 ± 0.2VRMS, 25°C. 1mHz for capacitance ≤ 100pF. 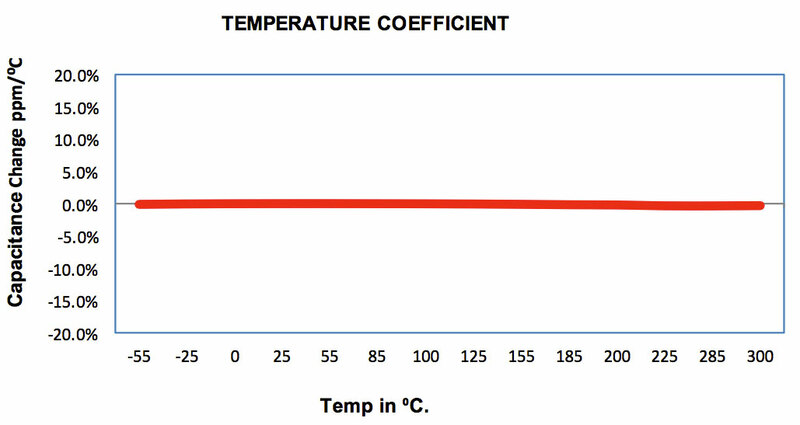 Operation Temperature Range: -55°C to 250°C. at 250°C > 1GΩ or 10MΩμF or whichever is less. 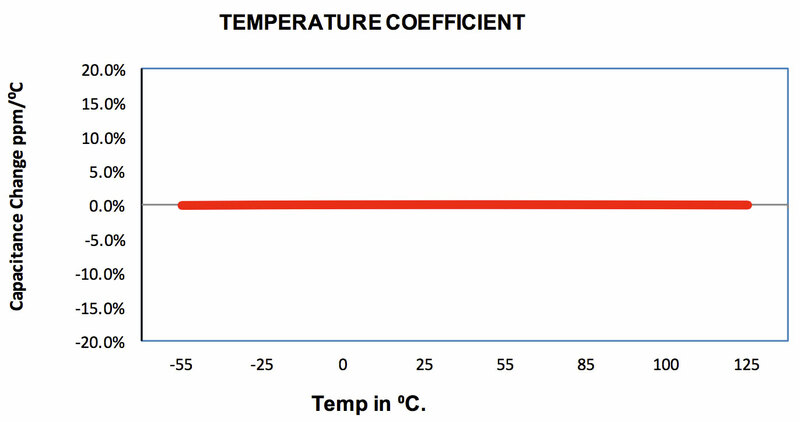 Operation Temperature Range: -55°C to 300°C. at 300°C > 1GΩ or 10MΩμF or whichever is less.